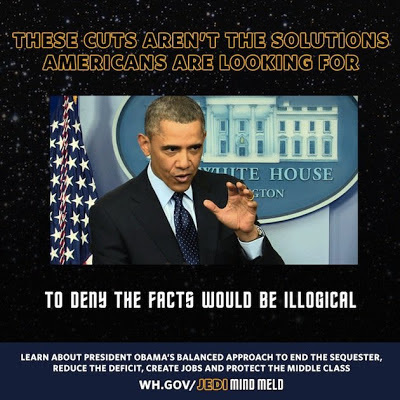 As you know, the sequester went forward yesterday. President Obama held a little presser during the daily White House briefing after a futile meeting with Congressional leaders. When answering a typically inane question from the Big Media about why he can't just "lead" our legislators into doing the right thing, he made the mistake of saying he can't just do a Jedi mind meld on them. ZOMG! A mixed sci-fi metaphor!!! Nothing else he said mattered after that. Twitter nerds immediately exploded into a snarkarama. BuzzFeed had a post up within two minutes and the rest of the intertoobz followed closely behind. Not to worry though, the crack White House rapid response team came to the rescue in the time it takes to construct a new meme. While the White House's default response is to find your lack of faith disturbing, this time it moved without Rancor to defuse the controversy with a tweet that quite deliberately blended both universes. (For those of you who don't speak the language, it's a play on "These aren't the droids you're looking for" and one of Mr. Spock's refrains, each in the appropriate font). You can be sure, there are some more subtle sci-fi references in there too, but I'm not well versed in their language either. In any event, the snarkers apparently aren't as clever as they think. This guy at MIT says they jumped the gun. It seems there really is a Jedi mind meld of some sort. I'm not a big Star Wars fan myself, so only guessing that a Vulcan mind meld would be better. Spock himself tweeted as much. Leonard Nimoy ‏@TheRealNimoy: "Only a Vulcan mind meld will help with this congress. LLAP"
One problem with that though. One Vulcan is not enough. As I said to him, "Well yes, but where are we going to find 232 Vulcans to do it?"